In our effort to understand the nature of Archaic Yoga, we are fortunate to have a reasonably comprehensive record in the 1028 hymns of the archaic Rig-Veda (“Knowledge of Praise”). Composed in an early form of Sanskrit, this is the oldest scripture in any Indo-European language and, as some scholars now believe, in the world. Until recently, most researchers placed the earliest hymns of the Rig-Veda around 1500 B.C.E., with the bulk of the hymns supposedly being several hundred years younger. This date, however, turned out to have been rather arbitrary. It started out as little more than a conjecture by a few Sanskritists in the nineteenth century, notably the German savant Max Müller (who was a professor at Oxford). But soon it became a long-lasting scholarly convention, at least at universities in America and Europe. Many traditional Indian pundits held out for a much earlier date for the Rig-Veda. Their various views are increasingly vindicated by the most recent research. In collaboration with Subhash Kak and David Frawley, I have sifted through and evaluated much of the available evidence in our jointly authored book In Search of the Cradle of Civilization. This was a dizzying adventure for us, leading to some extraordinary conclusions about ancient India. More and more scholars accept that the Vedic hymns belong to the third or even fourth rather than the second millennium B.C.E. This revised opinion is exciting for at least two reasons. First, it makes the Rig-Veda at least contemporaneous with the Pyramid Texts, which have been celebrated as the oldest written documents on Earth. Second, it brings the Rig-Veda chronologically in close proximity with the so-called Indus Valley civilization, which flourished between 2600 and 1900 B.C.E. In fact, as I will explain shortly, this chronological proximity has far-reaching implications. While it is true that the available manuscripts of the Rig-Veda are only a few hundred years old, the oral tradition that has kept this hymnody alive for well over four thousand years has been astoundingly accurate. We can deduce this from the simple fact that all the extant manuscripts recensions) of the Rig-Veda have only a single variant reading! 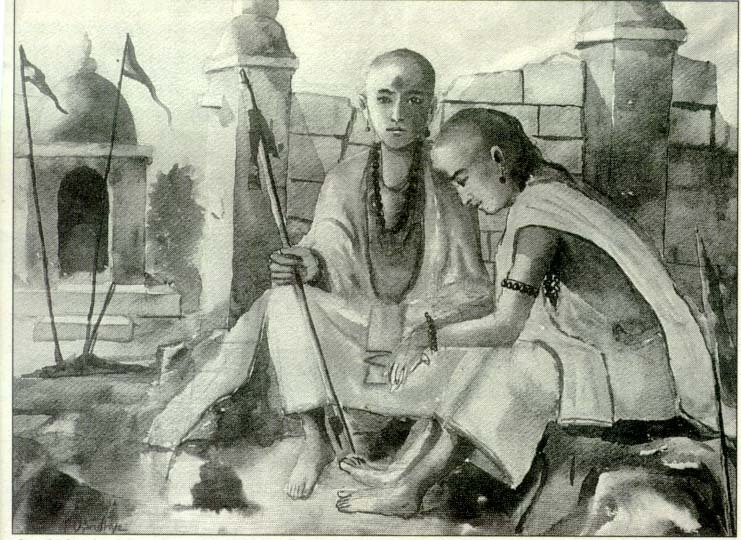 The Vedic hymns were held in such high esteem that priests (brahmins) were especially trained to learn and recite them with the utmost accuracy. The mnemonic technology of ancient India was and remains unsurpassed anywhere in the world. As far as the Rig-Veda is concerned, we can look upon it with the same confidence as we would in the case of a written text. Its fidelity of transmission is irreproachable. There are still brahmins alive today who can flawlessly recite the entire Rig-Veda as well as the three other Vedic hymnodies. To our forgetful modern brains, this appears almost a superhuman feat. Even for the ancients, who learned everything not from books but by word of mouth and memorization, this represents an extraordinary accomplishment. This is particularly impressive when one knows that for hundreds of years the brahmins recited the Vedic hymns without understanding much of their meaning, which had been forgotten long ago. This feat is almost comparable to learning 397,265 nonsense syllables, which is the number of syllables in the Rig-Veda. The revised date for the Rig-Veda now obliges scholars to look anew at the possible connection between the composers of this sacred work and the creators of the towns of the Indus Valley, notably the great urban centers of Mohenjo-Daro and Harappa. In fact, there are many excellent reasons for assuming that the Vedic people, whose religious beliefs and practices are chronicled in the Rig-Veda, were the same people who also created and lived in the numerous towns and villages on the banks of the Indus River and its tributaries. According to standard explanation, the Sanskrit-speaking Vedic people originated outside India and invaded the subcontinent between 1500 and 1200 B.C.E. (depending on which scholar one is talking to). This theory has been seriously called into question by the latest evidence. In particular, satellite photography and geology have proven instrumental in this revolution. For, as we now know, the mightiest and most celebrated river in the Rig-Veda—the Sarasvatî—had dried up by 1900 B.C.E. Its dry river bed now runs through the huge Thar Desert. This was one of the disastrous effects of a major catastrophe very likely caused by tectonic shifts affecting all of northern India, forcing the Vedic people to migrate to the fertile banks of the Ganges. Not only the Rig-Veda but also some of the Brâhmana texts (previously placed between 1000 B.C.E. and 800 B.C.E.) were composed long before the Sarasvatî River vanished. Today the Aryan invasion of India stands exposed as one of those scholarly hypotheses that grow into doctrinal myths that are as tenacious as they are wrong. Unbiased research now shows that there never was an Aryan invasion and that the Vedic people have lived in India since time immemorial. Admittedly, this new understanding is still under scrutiny from the scholarly establishment, which is notorious for resisting change. However, the evidence speaks for itself and will undoubtedly lead to a revolution in our understanding of ancient Indian history and ancient history in general. When we glance back at the beginnings of the Yoga tradition, we can detect elements of Archaic Yoga both in the Rig-Veda and some other ancient Sanskrit scriptures and also among the archaeological artifacts of the Indus Valley. But whereas the artifacts are rather limited and tell us very little about their meaning and possible use, the Vedic hymns offer us a reasonably detailed picture of the ideas and practices of Archaic Yoga. It is this literary evidence to which we must look for explanations. After this rapid historical overview, we can now turn to some of the actual teachings of the Archaic Yoga of the Vedic age. Archaic Yoga is nothing like Patanjali’s well-known eightfold path or the better known approach of Hatha-Yoga with its elaborate arsenal of postures (âsana). From what we can gather from the Vedic hymns, Archaic Yoga was less individualistic and, like shamanism, more intrinsically linked to the weal of the community rather than the salvation of the individual. Its principal concern was to discover through inspired inner vision (dhî) and ecstatic attunement the cosmic order (rita) and then to help preserve that order in the realm of human interaction through appropriate attitudes and actions. The Vedic people looked to their seer-bards, known as rishis, for the kind of wisdom that would allow them to conduct their lives in harmony with the divine or cosmic order. Through their own intensive spiritual practice, the Vedic seers acquired deep knowledge (veda) of the connection between Heaven and Earth, Above and Below. In profound meditation, they were able to directly experience the cosmic Pattern and then bear witness to it in their finely crafted hymns. We know that all the ancient cultures of which we have knowledge were preoccupied with understanding the divine order, as inscribed in the eternal pathways of the Sun, Moon, the planets, the stars, and in the rhythms of the Earth. They were most careful observers of the play of celestial and natural forces. They thought that unless human life mirrors the harmony of the heavens, it can only lead to chaos, lawlessness, devastation, and individual and collective suffering. It is in this profound concern with the heavenly order that we must also look for the beginnings of astronomy and astrology. In fact, as Professor Subhash Kak has shown, the Rig-Veda embodies an astronomical code, which is moreover reflected in the construction of the Vedic fire altars. As we learn from the Rig-Veda, the ancients also recognized the curious relationship between the outer cosmos and the inner universe, between the objective world and the subjective space, or psyche. Not only does the community as a whole have to mirror the harmony of the divine realm, also each individual person must establish within his or her own being that same harmony in order to ensure good fortune for the family, the clan, the tribe, and the human community at large. There is an important lesson here for us latterday practitioners of Yoga, for we sometimes forget the larger good and practice only for our own sake. Nor are we particularly aware of the interconnectedness of things, despite the advent of systems theory, ecology, and quantum physics. The Vedic seers aspired to illumined vision (dhî), or higher understanding deriving from meditative absorption and ecstatic transcendence of the limiting rational mind. They accomplished this through prayerful meditation (brahman) combined with ritual (karman), mantra recitation, and breath control, producing in themselves a state of incandescence known as tapas. This old Sanskrit word means “heat” but also “ardor” and is employed for the scorching heat of the sun as well as the inner heat created by intense spiritual practice and asceticism. Anyone who has seriously practiced any spiritual discipline will know what tapas means, and every highly motivated yogi or yoginî aspires to generate this intense inner state of being on fire. In the Rig-Veda, the word brahman does not yet have the meaning of “Absolute” or “ultimate Reality,” as in later Yoga and Vedânta metaphysics. It still denotes “prayer” or “prayerful absorption.” The term brahman is derived from the verbal root brih, meaning “to grow” or “to swell.” In Vedic times, it signified contemplative prayer by which the hidden powers of the human psyche or spirit were drawn forth and made to grow into visibility, that is, to take shape in the seers illumined vision. The seers contemplated the deep mysteries of the universe and what lies beyond all creation, and in so doing actually got in touch with those mysteries to the point of ecstatic self-transcendence. As one seer prayed, “Let prayerful meditation spring forth from the abode of truth” (Rig-Veda VII.36.1). Prayerful meditation was thought to rise to the divinities in the celestial realms Gods like Indra, Agni, and Sûrya and from there to return again, like wagons loaded with precious goods, to the seer and the human world at large. The seer-bards asked that their prayerful meditations would yield the “treasure of vigor,” by which they meant the well-being and abundance of energy accruing from contact with the invisible world of higher beings. Some hymn composers compared prayerful meditation to God Indras swift steed, while others likened it to a chariot. Yet, even though prayerful meditation was generated by the seers mental focusing, it was also in some sense understood to be “God-given” (deva-datta): effort plus grace, as is acknowledged in many later schools of Hinduism and other spiritual traditions. Contemporary students of Yoga, steeped in the secular values of our Western society, seldom have a sense of connection with the powers (divinities) of the invisible realms. For the Vedic seers, however, the divinities were concrete actualities whose support was sought in all matters, both spiritual and material. The Vedic seers also had a real appreciation for the power of ritual. Archaic Yoga was thoroughly ritualized. In contrast, Western students of Yoga tend to downplay or ignore the ritualistic aspects of Yoga, but they are quite pervasive and obviously serve a very practical purpose. Some Western Yoga teachers have been quite outspoken about what they perceive to be the unnecessary ritualistic and mythological baggage of Yoga. This attitude is unfortunate, as it can lead to a merely physical or a merely mental approach to Yoga. But Yoga has traditionally aimed at balance. Archaic Yoga is exemplary in its integrated orientation, with its emphasis on harmony and the embodiment of spiritual experiences in constructive social attitudes and actions. Those who dismiss sacred ritual and myth should remember that even in the face of (or precisely because of) our societys rampant secularism, people still ritualize their lives and mythologize their world. The big difference, though, is that secular rituals (watching football on Saturday) and secular myths (notably the notion of limitless progress) do not have the power to uplift or change us for the better. As psychiatrist Rollo May has shown in his last book, we cry out for myth. This is why so many people who have been deprived of their more traditional mythic anchorage seek intellectual and emotional refuge in aliens, end-of-millennium revelations, and other similar products of New Age provenance. Although the seer-bards aspired to give voice to the fruit of their prayerful meditations in the form of poetry, or hymns, they knew that essentially prayer was beyond the mind, or transcognitive (acitta). Yet sacred utterance was important to them. For, through masterful verbal communicationand the seer-bards were superb crafters of languagethe unnamable Reality could be hinted at and thus become an efficient means of self-transformation for their listeners. Their hymns are called mantras because they are tools for focusing the mind (manas) to accomplish the great work of penetrating into the mysteries of the cosmos and winning the “highest heaven,” the abode of immortality. The entire Rig-Veda is traditionally held to be a nonhuman revelation, because its 1028 hymns were all the fruit of the seer-bards prayerful meditations and visions. Thus this hymnody is in effect a product of yogic creativity, and the oldest one at that. For this reason, the translation of the Rig-Veda presents formidable difficulties, and several generations of Western scholars failed to do justice to this scriptures spiritual depth and symbolic intricacy. It took a great Yoga adept like Sri Aurobindo to wrestle from the difficult image-laden Vedic hymns something of their deeper meaning and to point scholars in a new, more credible, and rewarding direction. No doubt it will take several more generations of scholars who are spiritually sensitive or Yoga adepts with a penchant for scholarship to unearth the deeper layers of Vedic thought and symbolism. At present we can know the Archaic Yoga of the the Vedic period only partially (and this short article has barely touched on what we do know about it). To be sure, it is useful for Yoga students to acquaint themselves with the Rig-Veda. After all, it is the fountainhead of Hinduism and all later Yoga. Among other things, it shows us that the earliest masters of Yoga, the Vedic seers, were far from being life-denying ascetics without education or talent. They did not shun the mind but trained it for a higher purposethat of realizing their true nature in the immortal dimension of existence. They loved this world but were not captives of it. They loved the Infinite but did not fail to realize that for the Infinite to be truly infinite it must include the finite realm. These pioneers of the spirit were no primitives, as is overwhelmingly evident from their highly skillful poetry. If their symbolic language is alien to us, it is perhaps because we ourselves have become so alienated from the deeper levels of our own psyche and from the invisible realms of existence.